**Please note. 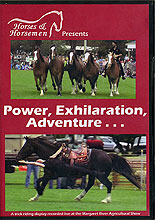 This DVD is in PAL format and can generally only be viewed on a computer DVD player. Be exhilarated by this daring and dangerous display. Demonstrating trick riding at its best, Sascha performs vaulting, and suicide and fender drags. Hanging from her horse in the stroud layout she fires an arrow from a bow, plus much more - all at the gallop. In a stunning display with his Liberty Team, Sam manages his four Clydesdale cross horses (while astride a fifth) performing wheels, backups and connections - all by voice. They then transform into a Roman Riding team with Sam astride the pair behind, directing the two in front. He meticulously maneuvers the whole team through and astride a set of barrels - cantering at full speed. Sam and Sascha's performance is an awesome spectacle, where the sharing of information between rider and horses has reached new heights of sophistication.